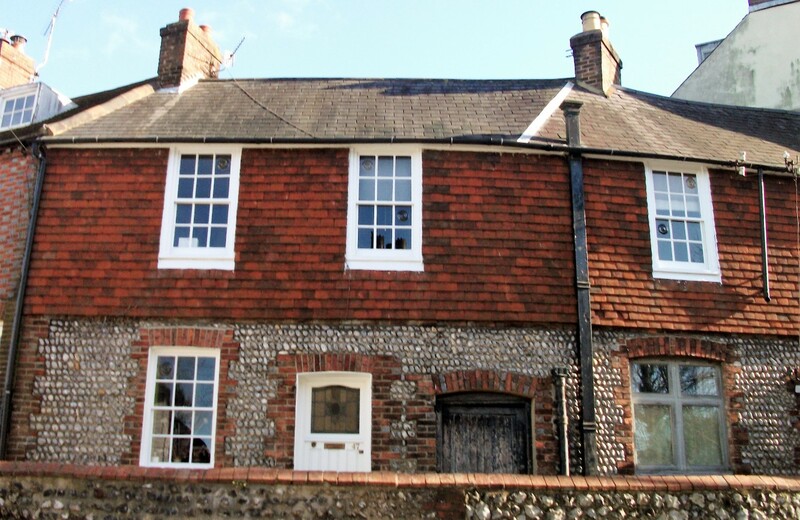 In Part 1 of my Abinger Place history, which was posted on the website in 2016, I described how the land known as St Johns Croft had been pasture land within the Borough of Lewes in Saxon times and was owned by the church until it moved into private ownership in the 18th century and became known as Kemps Field after the family who bought it. The need for development in the town continued in the 19th century with the rise in industry and a steadily increasing population. By around 1807 the eastern half of Kemps Field had become Sun Street 2. The high flint wall behind the houses on the west side of Sun Street was probably built at this time. (Part of this still exists marking the boundary of the back gardens on the east side of Abinger Place). The remainder of Kemps Field was now ripe for development. The following account describes how this came about and includes descriptions of the houses built in the 19th century and details about some of the residents during this period. My thanks are due to all those who have contributed material. I have made every effort to be accurate and I hope this story will be of interest to readers. The 20th century remains to be told and I would be interested to hear from anyone who is inspired to help investigate this. Please click images to enlarge. All coloured photos are © Judy Gable, unless otherwise attributed. 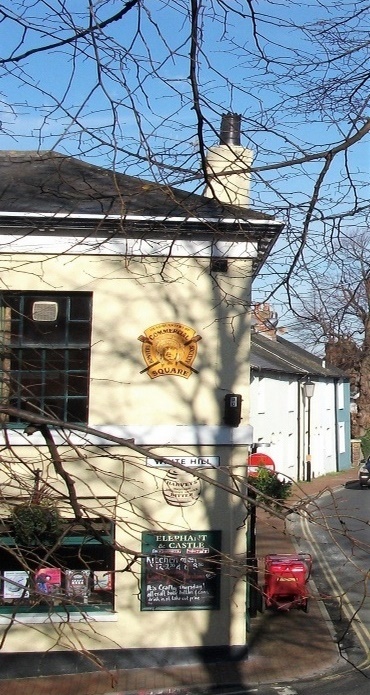 The development of Abinger Place (known as Church Street at the beginning of the 19th century) first involved levelling the Saxon mounds described in Part 1. Two of these were in the churchyard, a third on the site of 1-3 Abinger Place and Abinger House and a fourth where the Elephant and Castle stands today. What, if anything was found under the mounds? The exhumed bones have been recorded as those of animals by scientist Gideon Mantell and included a perfect skeleton with a boar’s head 3. The gallows could well have been sited on the mound where the Elephant and Castle stands today as it was common practice for them to be in a prominent position for all to see. With the levelling of the mound the gallows would have been re-sited but it was not until 1831 that they were moved to a site where Lewes Prison now stands 4. (Nowadays a plaque marking the site of the gallows can be seen in the wall on the west side of Abinger Place). Further along the road another plaque can be seen noting the site of the manor pound and the stocks which were also removed when the mound opposite was levelled. Stocks were often placed near churches so that those held in them could be easily ridiculed and humiliated by anyone walking along the path to the church and were widely used in England between the 14th and 19th centuries 5 . 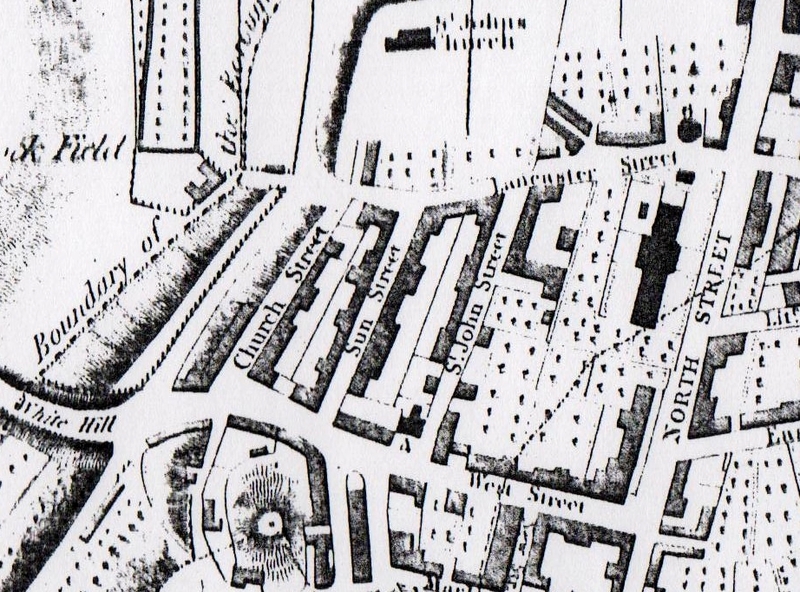 The Ordnance Survey map of 1873 shows the town wall on west side of Church Street, St Johns church and four trees which were anecdotally known as Matthew, Mark, Luke and John. The large tree next to the plaque about the site of the gallows is still known by some as Luke today. In recent years another tree has been planted in Matthew’s place near the plaque commemorating the stocks. The process of ‘macadamisation’ (after engineer John L McAdam) for building roads came into use during the time that Church Street was being constructed 6. This meant that instead of muddy, stone/chalk tracks, roads could now have a smooth hard surface. The pavement on the east side was raised and a retaining flint wall was built between the pavement and the road presumably to accommodate the fall of the land. 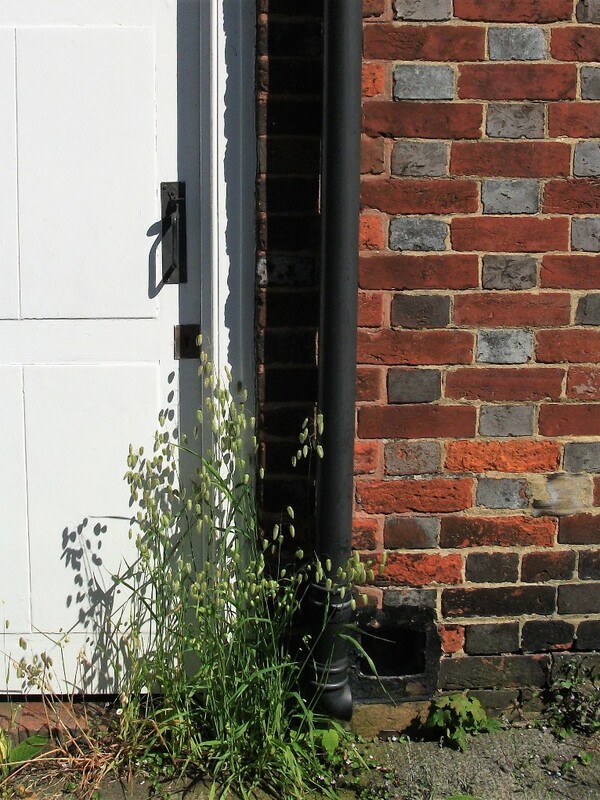 A brick gutter was built between the pavement and the wall to carry the rainwater from the downpipes of nearby houses into the road and thence downhill to the Pells. This system for dealing with excess rainwater is currently still in operation today. The maintenance of the road and pavements was the responsibility of the Town Improvement Commissioners who, following an Act of Parliament in 1806, had powers to pave and clean the streets in the town 7. In 1822 gas lighting was introduced. This was also under the control of the Improvement Commissioners. Gas lighting was gradually replaced by electricity which came to Lewes in 1901. 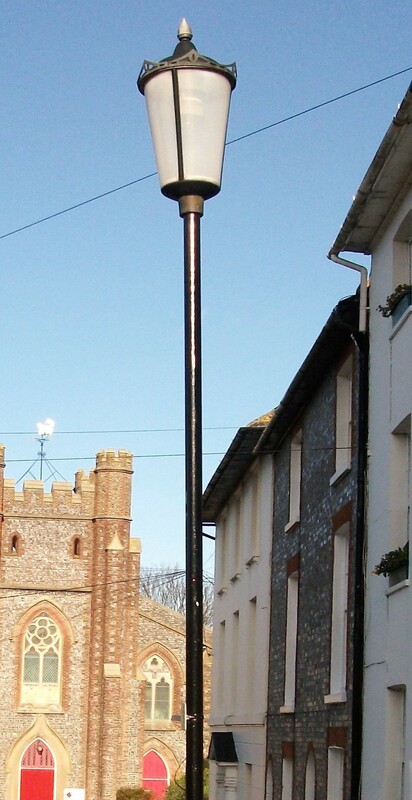 Cast iron lamps can still be seen in Abinger Place today as can telegraph poles and a working red public telephone box which were most likely installed in the first half of the 20th century as telephone usage became more common generally throughout the country 8. A telephone exchange for the town was built in Abinger House). East side: Block 1, Block 2, Block 3. Building began in 1812 with Block 1 on the east side. Development of the other blocks of land along both sides of Church Street was complete by the second half of the 19th century. Thomas Kemp had left this part of Kemps Field to his brother Nathaniel so he could pay off his debts and in 1812 Nathaniel Kemp and his son Thomas Reed Kemp of Herstmonceux Place sold it to Joseph King and his trustee Joseph Morris of Lewes (butcher) for £132. The first dwellings were built midway along Church Street. Joseph King’s terrace of four cottages was built in red and grey brick with the rear walls constructed of flint. Each house had an outside toilet and there was a shared well and a communal wash house. The construction of the houses appears similar to those in Sun Street described in detail by Brian Cheesmur in The Sun Street Story. A central passage way with the date of 1812 inscribed on a plaque above the entrance, gave access to the back of each cottage. In 1819/20 King sold numbers 9 and 10 (now 31 and 33) to Arthur Slater (a yeoman of Lewes) and 12 (now 37) to James and William Steere in 1833. After 1812 there was a slump nationally in the construction industry which continued during the agricultural depression of 1815. However with the continuing rise in population and demand for housing, the industry revived and by 1821 construction was taking place along White Hill and Offham Road as well as being resumed in Church Street. In 1818 the piece of land to the north of the existing terrace was sold by the executors of Thomas Kemp to Sarah King (wife of Joseph King) for £324 17s 6d. She then sold it to John Cowper (carpenter and later county surveyor) and his trustee Francis Harding Gell (gentleman) for £400. A house, workshop, warehouse and buildings were built by John Cowper between 1818 and 1839 and reflect the taste for a stone-look which had replaced the popular red brick and the chequered red and grey brick of the previous building boom. 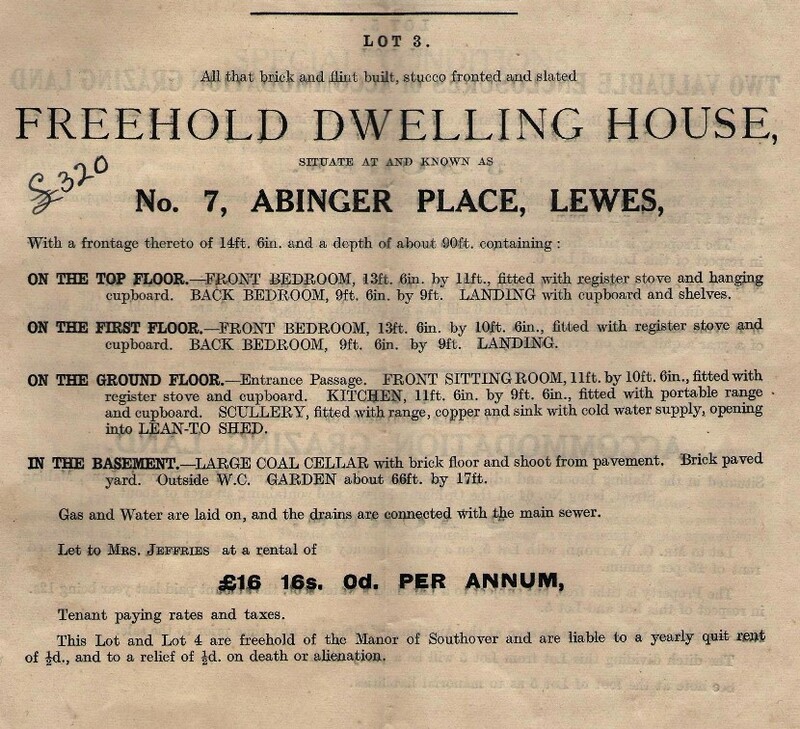 With the increasing development in the area, house numbers became necessary and Cowper’s buildings became 1-3 Milton Terrace and Milton House (now 1-3 Abinger Place and Abinger House). 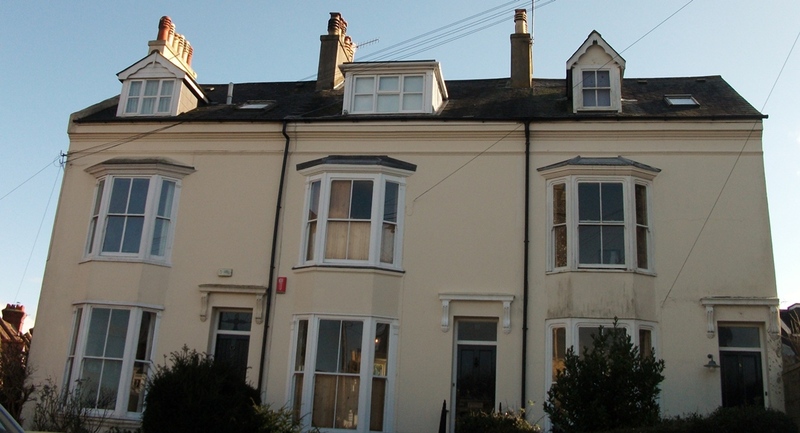 In 1827 John Cowper built two more houses (shown right) using the grey bricks popular in the 1820s to give a stone-like appearance edged with the familiar red bricks. Flint was used at the rear. 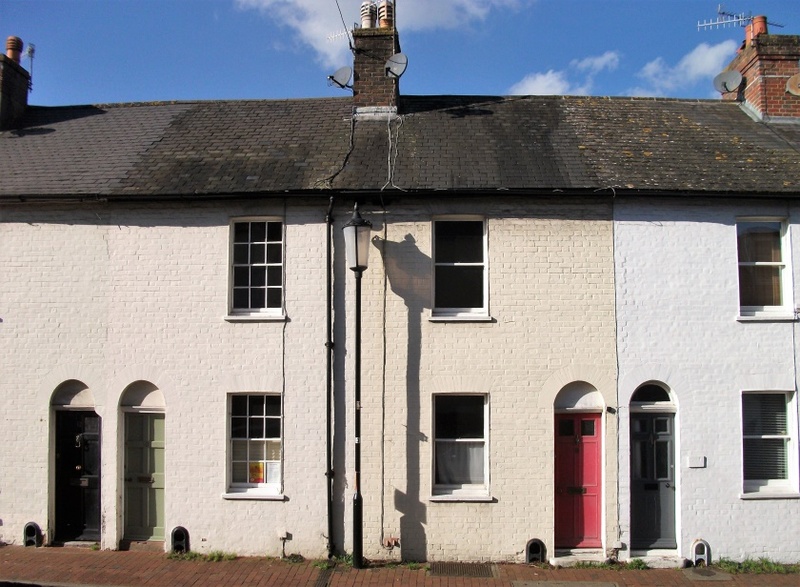 Two further houses (numbers 7 and 8) of ‘brick and flint with stucco fronts and slated’ were built at this time. (Present residents recall a well unearthed at the back of number 7 during work in the 20th century). These houses are noteworthy for the figurative Coade keystones above the doors which are thought to be of King Alfred who was considered a hero by local Radicals of the time such as James Scarlett (later Lord Abinger). (For more details see section ‘How Church Street became Abinger Place’). Eleanor Coade (1733 -1821), a London businesswoman, was known for manufacturing high quality neoclassical statues, architectural decorations and garden ornaments. Coade stone features can be seen on buildings such as The Royal Pavilion, Brighton, Royal Naval College, Greenwich and Buckingham Palace. Coade stones continued to be manufactured until 1833 10. 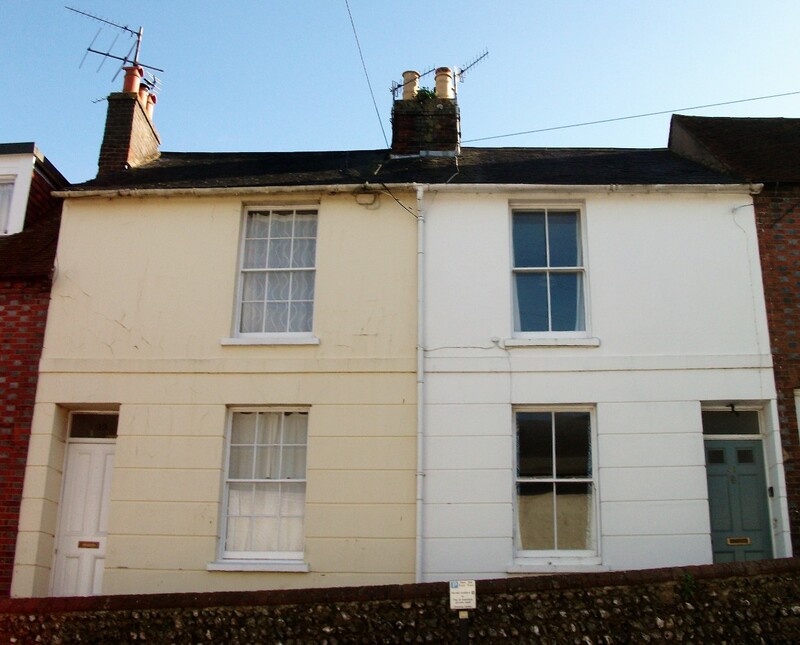 In 1837 John Cowper sold these houses to Latter Parsons of Lewes, a stonemason for £475. He died in 1903 leaving the properties to his daughter Joanna Mannington. 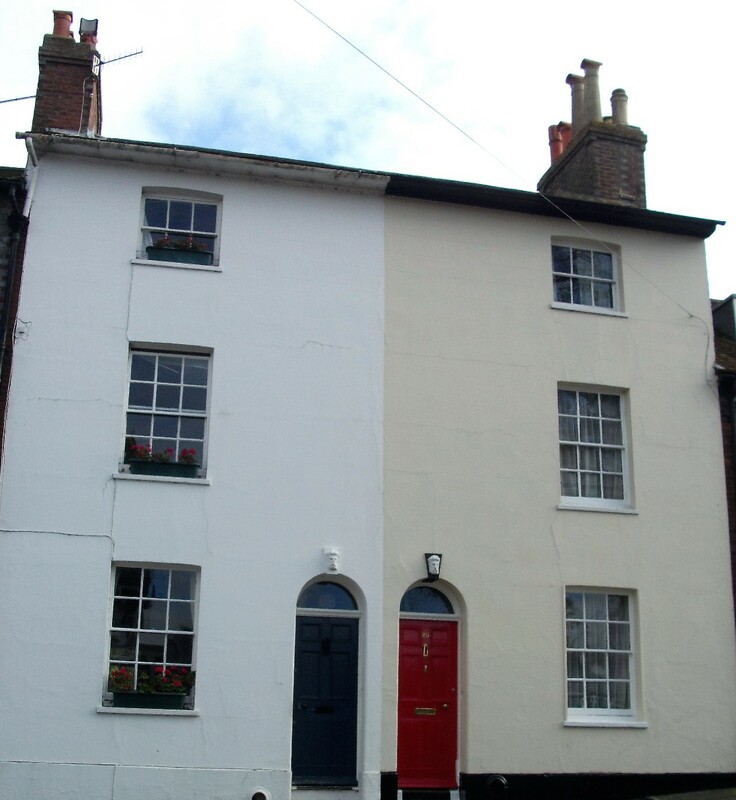 Following her death, her trustees sold Number 7 to George John Gillett of Sydney House, School Hill, Lewes for £320. 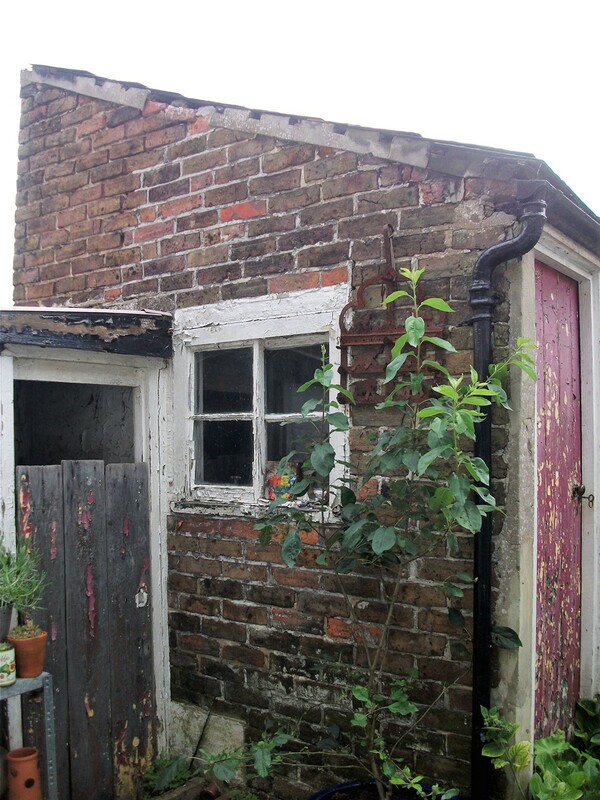 The property was described as having a frontage of 14’6” with a garden of 66’x17′, 4 beds, sitting room, kitchen, scullery, lean-to shed, coal cellar, outside WC as shown below in the particulars of a later sale in 1920 11. The particulars of the sale below note that by 1920 there were connections to gas and water supplies and drains linked to a main sewer The adjoining house, Number 8, was sold at the same time and for the same amount. In 1812 the trustees of the Kemp family sold a third plot of land in Church Street. In 1827 this was owned by Sam Hillman and houses built here in 1846 were noted as having ‘valuable frontage’ when sold by trustees of the Hillman family. 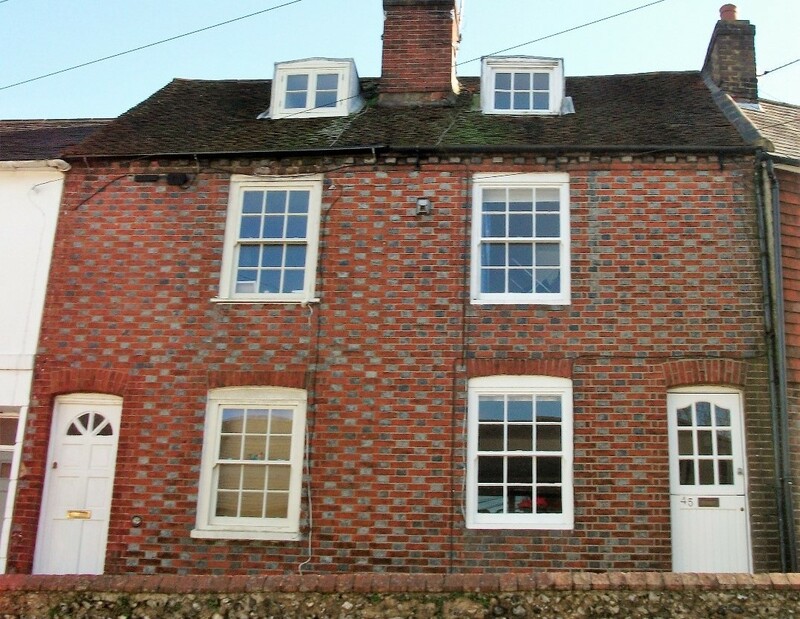 As with the other houses in Church Street, the rear was built with flint which was a plentiful and cheap source of building material. Nowadays house number 47 exists. However in the 19th century there seems to have been only an outbuilding at the back of 1 Mount Pleasant (then a greengrocers shop) which was converted into a builder’s office in 1959, then a showroom in 1961. Both this and 1 Mount Pleasant became residential properties in 1972. It is understood that number 47 was built over the original well during the conversion. The land on this side of Church Street was manorial waste land (common land belonging to a manor) on which had been a mound, the gallows, the stocks and a pond. Between 1804 and 1822 Sarah and Ben Ridge bought this land and in 1812 built two houses at the south end (where the Elephant and Castle is today) which they let to tenants. 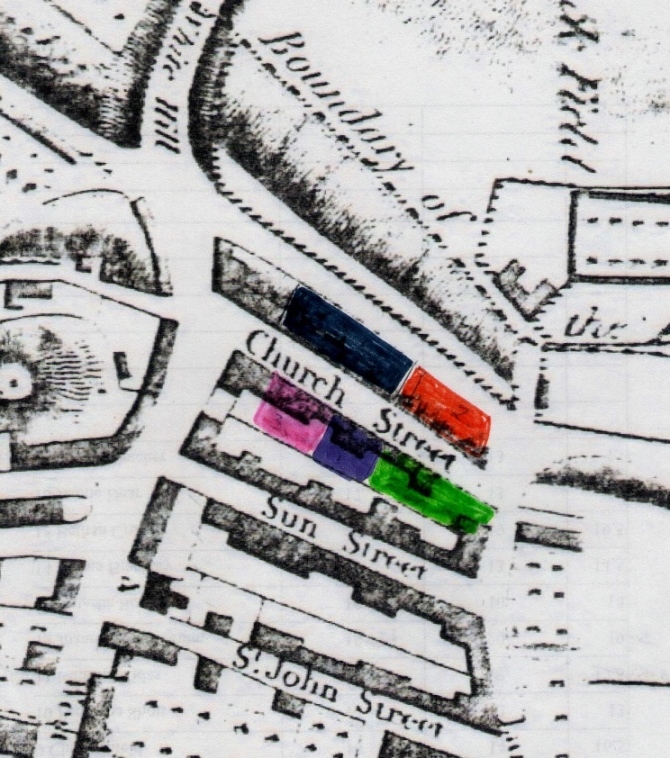 In 1822 they sold part of the remaining land in two plots (Blocks 4 and 5 shown on the map above). Block 4 was bought by a builder (J. Boxall) who built four houses (1-4 Church Street) below. (It was at the beginning of the 21st century that Numbers 14-18 Abinger Place were built on the piece of land that was originally the gardens of the two houses owned by the Ridges). 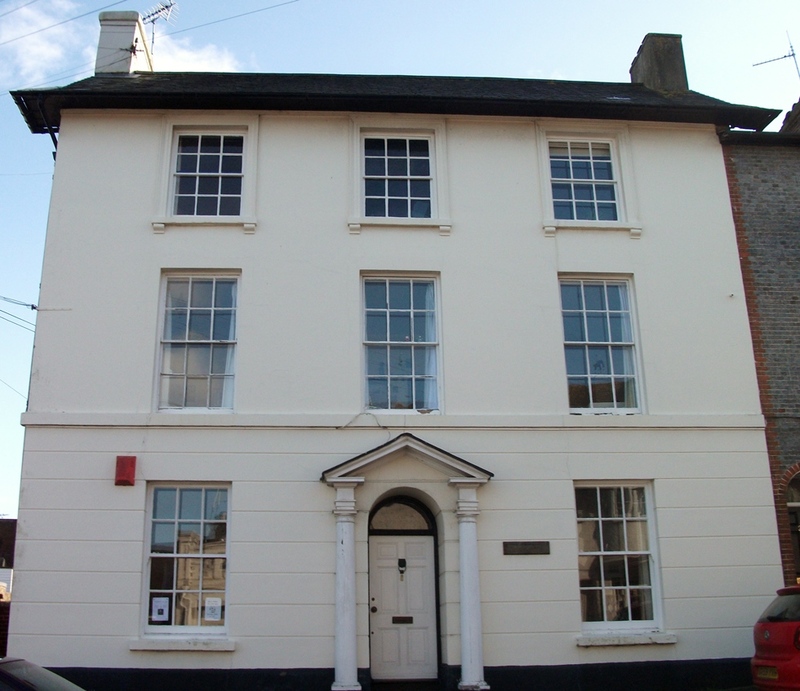 Block 5 was bought by John Cowper who built Lime Cottage (5 Church Street) which he owned until 1835 and let to tenants. 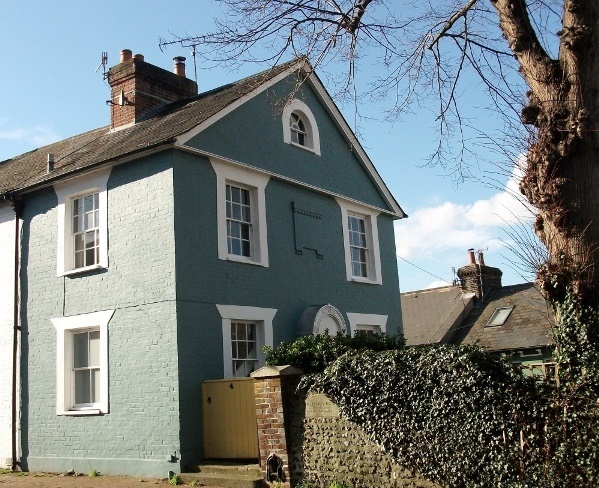 Lime Cottage was sold in 1920 by the trustees of the late Mrs Joanna Mannington. She had inherited it from her father Latter Parsons who had bought it from John Cowper in 1820 in addition to 7 and 8 Church Street (see above). When building was completed there remained one undeveloped piece of land on the west side, north of Lime Cottage. This was the remainder of the manorial waste and was part of the land bought by John Cowper in 1822, then sold to Latter Parsons, and inherited by his daughter Joanna Mannington. After her death it was sold as ‘garden ground’ in 1920 at the same time as 7 and 8 Church Street and Lime Cottage. At the time of the sale the tenant, Rev J P Morris, paid a rent of £1 pa. (It was not until 1926 that a working garage was built on this land known as Gallows Bank and later converted into the garage units and living accommodation that can be seen today). With the expanding population in the New Town the Saxon church of St John became too small to accommodate the congregation and plans for a new one were proposed by John Cowper. These incorporated features from the demolished Saxon church, including a doorway with its medieval inscription to Magnus, the Danish warrior prince who became an anchorite. Before the upheaval of building the new church took place, the churchyard itself was defiled by Resurrection Men who visited secretly at night in 1830 and exhumed human remains to sell to hospitals for dissection and experimentation. The new church was built by George Cheeseman of Brighton in 1839 during the ministry of the rector Peter Guerin Croft (1799-1847). His father had been rector before him and his grandfather John Croft, a barrister in Lincoln’s Inn, had been patron of St Johns since 1741. The new church was called St John-sub-Castro which identified it in relation to the castle. (The church has been designated by English Heritage as a Grade II listed building. A more detailed history of the building can be seen online 12. (An interesting anecdote linking this period with 2014 concerns a recent resident who moved to Abinger Place from overseas and discovered that one of the early weddings in the new church only a few yards away from his present home, had been that of one of his ancestors and a local girl over 170 years earlier). Although strictly on White Hill, the Elephant and Castle is a landmark in Abinger Place. Before it existed the land had been manorial waste, part of the demesne of a manor left uncultivated and unenclosed, over which the freehold and customary tenant might have rights of common (Hansard). The land was sold in 1812 to Sarah Ridge and two houses were built which were let to tenants. These were converted into a public house in 1838. The first landlord was a Robert James who was succeeded in 1851 by J. Diplock from Fletching. The pub remained in his family for the next 40 years 13. 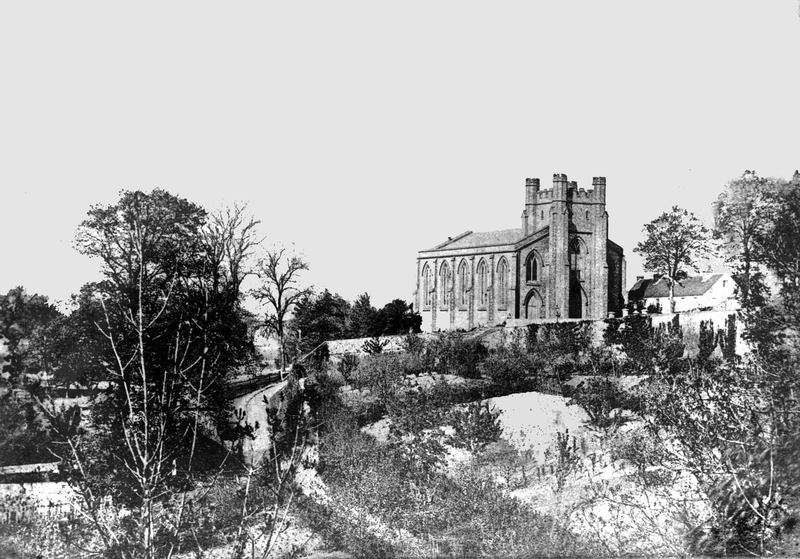 Although Church Street was an apt name for the new road leading to St John’s church, this was changed to Abinger Place at the time of the town’s political link with the first Lord Abinger of Abinger House in Surrey 14. Lord Abinger’s land extended from Surrey to Sussex and included Lewes. As Sir James Scarlett, he was an eminent lawyer and politician who had stood as a candidate for Lewes at the general elections in 1812 and 1816 but was narrowly defeated each time. However he was elected in Peterborough in 1819 and rose to an influential position in the government of the day. He was awarded a peerage in 1835 15. With the change of name of the road the houses gained a new address but retained their number or name. 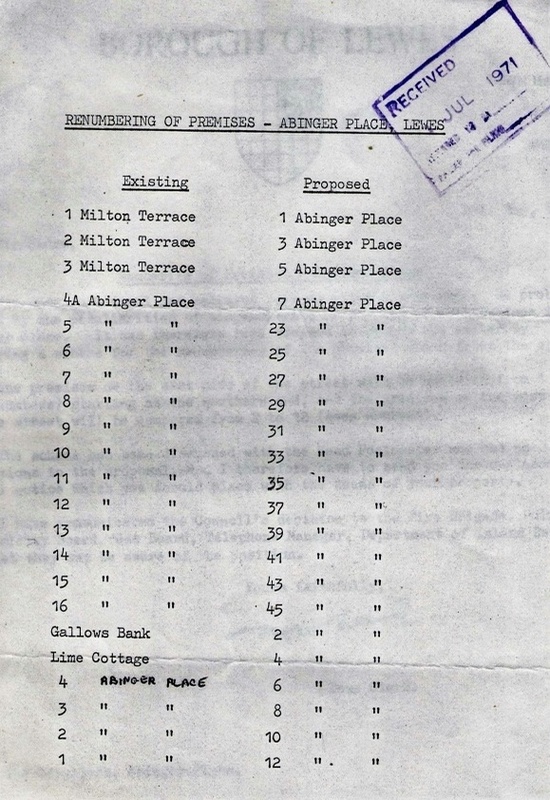 Numbering began on the west side (Block 3) with 1-4 and 5 ( also known as Lime Cottage) and then continued on the east side with Milton Terrace and the rest of the houses in Blocks 2, 1 and 3. In 1971 the Borough Council changed the numbering as shown on left 16. 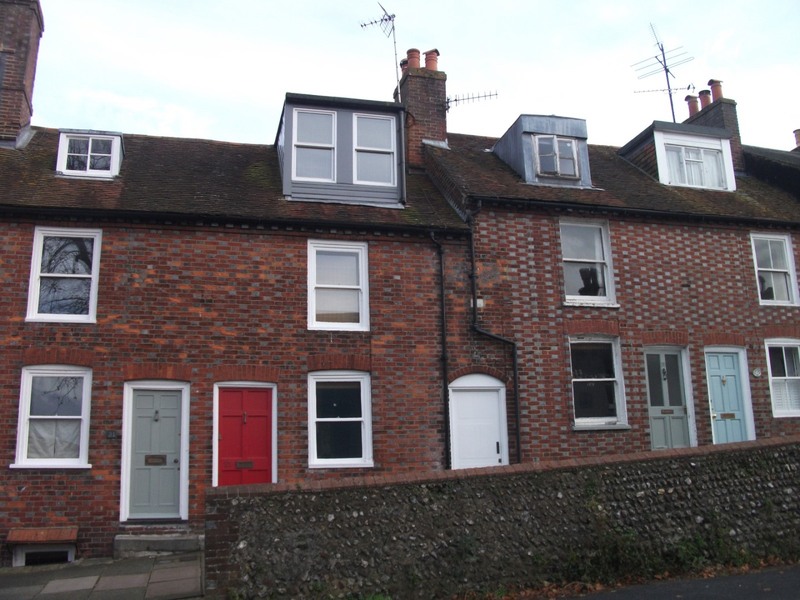 Living in Abinger Place during the first half of the 19th century would no doubt have been like living on a building site due to the rapid development of the area. However a new community emerged amid all this activity with nearby shops and businesses in Mount Pleasant and White Hill serving the growing number of residents. Information about them has been gathered by Judy and Colin Brent in Lewes House Histories and is extracted below 17. No particular occupations are recorded for some residents, presumably these had private means. Many residents were tenants and their families and many would have worked from home. They appear to have been a hard working group of skilled and semi-skilled people as shown below. These first dwellings were built in 1812. Ownership of the properties changed several times during the century and for the most part they were rented out. The tenants’ occupations included dressmaker, dairyman, labourer, cowman and milkman. These larger houses were built around 1827. In 1871 records show that 1 Milton Terrace was the home of a tailor employing 14 men. Number 2 was the home of an ironmonger, number 3 was occupied by a baptist minister. In the 1860s Milton House, with its coach house and stables, became a boarding and day school with John Dudeney (1782-1852) as its head. He was a self-educated former shepherd who had started his own school in 1804 probably first based in Holly Cottage, St John Street. In 1851 the two houses to the south of Milton House (now 23 and 25) were the homes of a solicitor’s writing clerk and a clerk to the poor law union. By 1879 number 6 had become the home of the manager of the show department of Etna ironworks where he was employed for 25 years. In 1851 the neighbouring houses (now 27 and 29) were the homes of a newspaper reporter and a foreman boot and shoe maker. In 1867 number 7 was owned by publisher and printers JB & Jos Farncombe. By 1871 JB Farncombe had left the publishing business and by 1873 had become a licensed victualler. Number 8 was occupied by a cattle salesman at this time. In 1871 a gardener lived at number 14 (now 41). In 1851 Ben Turner, a master wheeler lived at number 16 (now 45) and by 1871 Theodore Elphick, boot & shoe maker for 50 years, was occupying this house until he died in 1917. In 1861 a grocer and shoemaker lived in number 1 (now 6) and in 1871 the house was occupied by a milliner. 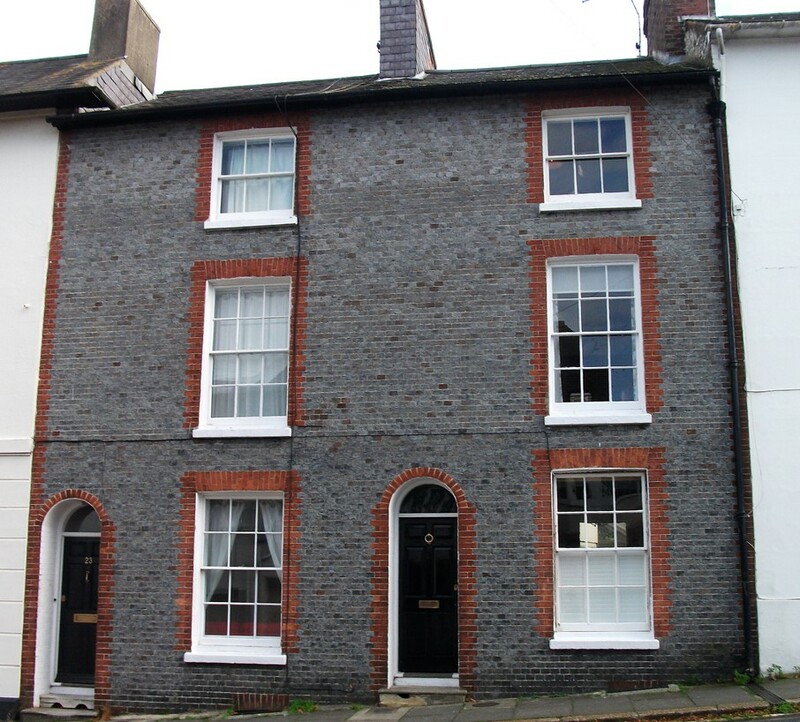 Next door number 2 (now 8) was lived in by a schoolmaster who was also clerk at Lewes Gaol in 1851. The house became a lodging house in 1862 but by 1871 was the home of a shop man employed by Messrs Madgewick who was said to be ‘a sidesman and thorough type of conservative working man’. A tea dealer and later shopkeepers lived at number 3 (now 10) and in 1871 it was the home of a Dissenting minister. There was a time when a solicitor’s clerk, then a master mariner and later a dressmaker occupied number 4 (now 12). Number 5 (Lime Cottage) (now number 4) was at one time a lodging house and later occupied by a printer’s clicker. And finally the following extracts from the Sussex Advertiser at the time give a flavour of some daily life in Abinger Place 18. Particulars of Sale of the estate of Mrs Joanna Mannington in 1920, contributed by the present resident of Lime Cottage.